Water kefir is a lacto-fermented beverage made with water kefir grains and sugar water. It is easy (and relatively quick) to make, and provides an abundance of probiotics to improve digestive health. Water kefir grains are not grains at all, but rather bacteria and yeast existing in a symbiotic relationship. The term grains really just describes their appearance. Because the grains feed on sugar, the resulting beverage is not overly sweet. Water kefir is often bubbly and has a reputation for being a natural alternative to soda pop. Is water kefir different from dairy kefir? Yes. Water kefir grains and dairy kefir grains are two different things. Dairy kefir grains are whitish in appearance and generally clump together, they feed on lactose and grow well in milk. 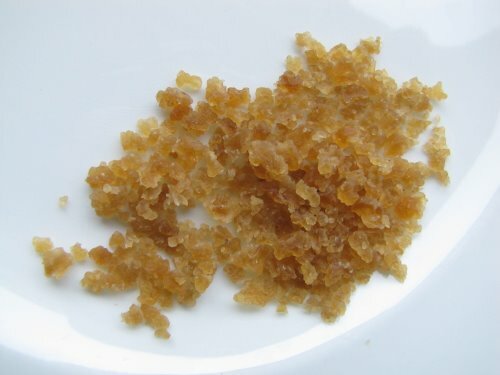 Water kefir grains do not clump together, and are clear and translucent. They often take on the color of the beverage or type of sugar used in the culturing process. For example, my kefir grains have a browinsh tint due to the fact that I use sucanat in my sugar water mix. It is possible to convert dairy kefir grains to make water kefir, but it is my understanding that they will not last as long as true water kefir grains, which will multiply indefinitely. Where do I find water kefir grains? If you have a friend who makes water kefir on a regular basis, chances are they will have extra grains at some point. Mine were almost doubling with each batch! 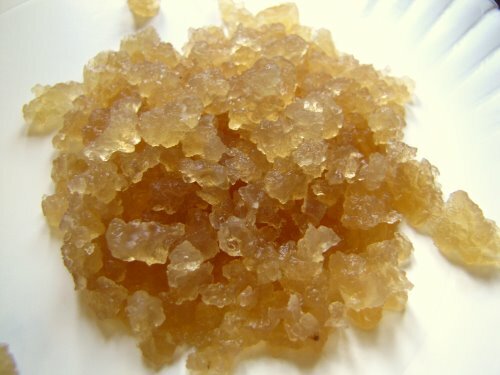 There are a number of places online to purchase water kefir grains. I bought mine from Kombucha Kamp and have been extremely happy with them (like I said, they were doubling with each batch. They are very healthy grains)! While it is possible to buy fresh grains, my preference is to get dehydrated ones (unless I were to get them from a local friend). The reason for this is that life is often hectic and fresh grains need to be dealt with immediately, while dried ones can wait until you are ready. It would be disappointing to spend money on grains only to lose them due to unforeseen circumstances surrounding their arrival in the mail! Most grains come with instructions for rehydration, which generally involves soaking the grains in a sugar water mixture for a few days. The grains I purchased required 3 to 4 days of soaking. To make the sugar water mixture for rehydrating dissolve 4 to 6 tablespoons of sugar in 4 cups of water and let cool to room temperature. Pour into a glass jar and add the dehydrated grains. Cover with a tea towel or coffee filter and secure with a rubber band. Let sit until grains are plump (no longer than 5 days). During the rehydration process, 2 tablespoons of dried grains plumps up to approximately 1/3 cup! Once this process is complete you are ready to make water kefir! Making water kefir is not an exact science. The general idea is to dissolve sugar in water and allow the grains to ferment in this mixture for one to three days. Once fermented, remove grains and drink kefir as is, or add flavoring (in the form of fruit of juice) and allow to ferment for another day. It is during this second ferment that kefir often becomes very bubbly (but not always). The amount of sugar, type of sugar, length of fermentation, and type of flavoring can all vary. :: In a pot, on the stove top, dissolve 1/3 cup of sugar in 1 cup of water*. Allow to cool a little then add 3 cups of water. 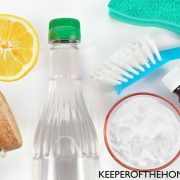 Pour this mixture into a 1/2 gallon mason jar and add another 1 1/2 to cups of water (so the jar is filled close to the shoulder or 6 cup mark). :: If the water is room temperature, add 1/3 cup of water kefir grains. :: Add 4 drops of liquid minerals. :: Cover with a tea towel or coffee filter and secure with a rubber band. :: Leave in a warm place to culture for 24 to 72 hours. The longer you leave it, the less sweet it will be (the grains eat the sugar!). Be sure to use a plastic strainer as metal is reactive and not recommended for use with kefir grains. Store the grains in a sugar water mix in the fridge or use them to begin a new batch of water kefir. Once the grains have been removed, I like to do a second fermentation. 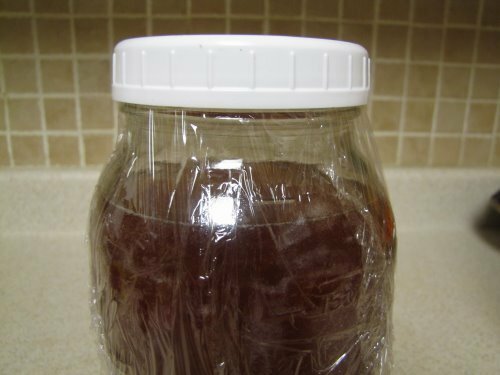 Instead of using a towel or coffee filter to cover the top, place plastic wrap over the mouth of the jar and then the lid. This will keep out the air and allow bubbles to form. 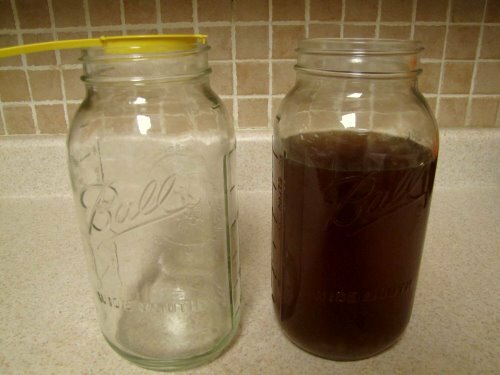 Leave the water kefir covered for another 24 to 72 hours. Then strain out any fruit pieces and pour into a clean container or bottle. It is possible to place the kefir grains directly in juice or sugar water containing dried or fresh fruit. If you have extra grains, then I would suggest experimenting with these methods, but when just starting out I highly recommend keeping the grains in sugar water only. This way they will not be compromised before you have any extra stored away. To make fruit juice water kefir: Place 3 Tablespoons of kefir grains in 1 to 2 quarts of juice (preferably organic). Cover as directed for the first fermentation and allow to sit for 24 to 48 hours. Strain and enjoy! 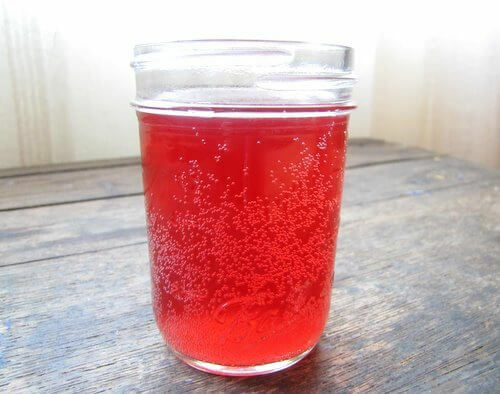 Cream soda: Add 3 teaspoons of pure vanilla extract to 2 quarts of water kefir after straining. Increase (or decrease) amount of vanilla to your taste. Wellness Mama has an easy to follow water kefir recipe here. Add raisins, dried figs, or whatever takes your fancy! If you need to take a break from making water kefir, the grains may be stored in the fridge for up to two weeks in a sugar water mixture. Dissolve a 1/2 tablespoon of sugar in a 1/2 cup of water. Cool. Add grains and sugar water to a clean, airtight container. Keep refrigerated. I use sucanat because it is less processed than other sugars and still contains minerals, which the kefir grains love! If the sucanat flavor is too strong for your taste, try using organic sugar, or half organic sugar and half sucanat. Since kefir grains love minerals, it is important to use water with a high mineral content. Spring or well water are the best options. If it is necessary to use tap water, remove the chlorine by boiling the it first. Have you tried water kefir before? What is your favorite flavor combination? For furit juice kefir I don’t do the 2nd ferment. I mix the juice with the water in the initial ferment and I mix it 50/50. 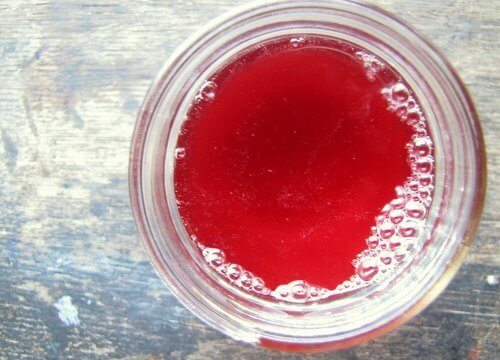 The girls love grape juice kefir like this. Do you still add sugar to the water or just 50/50 water and grape juice? @monique, do you still add sugar to the water or just use grape juice and plain water? @carmen, sorry, didn’t realize that both of my comments posted. We have been enjoying water kefir for some time now. I recently read to add a half of egg shell, this would be for the minerals. 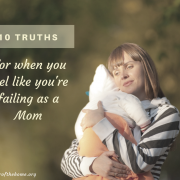 I did noticed a HUGE difference and we always have broken egg shells. I also want to find those reusable soda bottles, I read it keeps the soda fizzy and more carbonated. I am going to check into wine making places to see if they have any. I haven’t ventured into kefir yet, but I am definitely interested. Maybe this summer? I have never heard of this! I have a daughter with a sensitivity to casein, and have been concerned about the whole probiotics issue. Do you happen to know what kinds of probiotics are in water kefir? Her testing showed an overgrowth of L. acidophilus, and recommended non-D-lactate forming bacteria. Not impossible to find, but VERY expensive. @Gail, http://www.yemoos.com/waterkefirstrains.html This shows the different strains in water kefir. wow. I have always been intimidated by kefir and have not been too interested in dairy kefir, but this totally looks doable! Thank you for sharing this info with us, and hopefully I’ll get up the courage to make this soon! I make dairy kefir all the time but haven’t ventured out to water kefir yet. I did purchase some dehydrated water kefir grains almost a year ago and they have been in my freezer the whole time. Does anyone have any idea if they’re still good to use? can children drink this? how young can they drink it if so? I love to ferment! I am big into fermenting veggies and making milk kefir. I have some water grains and I think this post is the motivation I needed to get them going! I have a question for you, are there any scientific studies out there about kefir? I am trying to get the rest of my family on board and they are the kind that needs mainstream proof. Thanks! I have never tried water kefir. I am interested if these are dairy free probiotics. Are the benefits different than just taking a probiotic? @momOfFour, I accidentally replied to your comment and another comment below! Hope I answered your questions 🙂 (See my reply to Charis). i am a bit behind… what are the benefits to kefir? i have never used them. sounds super interesting. @charis, It is my understanding that water kefir grains are dairy free. The greatest benefit they have, and the reason I use them, is the beneficial bacteria they provide. Traditional diets were rich in probiotics. I think it is good to get probiotics from a variety of sources, water kefir being just one of them. It always seems to me that getting vitamins, minerals and probiotics from food and drink (whenever possible) is superior to that of taking a supplement in that it is more easily absorbed and used by the body. I know that a benefit many people find is that this beverage helps to kick the soda habit. I can’t attest to this fact though. But I will say that when I feel like something sweet and bubbly, I go for the water kefir. The fruit juice kefir has been the tastiest and most likely to be consumed by my children. @Stacy @ Delighting in the Days, thank you for your answer! i make homemade yogurt for the probiotics. i am not a soda fan, but it sounds like a great way to avoid the lactose so i may try it out for my kids. We’ve been making water kefir about every two days for the past 3 months. I also bought my grains from Cultures for Health. For the second fermentation, I strain the kefir water directly into an airtight stopper bottle (a.k.a. Grolsch – type bottle). I had difficulty finding these bottles until I realized they are the same bottles that French sodas come in. I bought a few of these bottles from Cost Plus and Whole Foods. (I use fruit juice and not fruit pieces, so I don’t need to strain them out after the second fermentation.) I really wanted to like using sucanat, but the results taste a bit “band-aid”-like to us — even when I tried to do half white sugar and half sucanat. Now I just use straight organic white sugar. This has been a great alternative to soda — sometimes it’s more bubbly than other times; I guess it depends on the fermentation time and type of juice we’re using. @Karen, I have read of others using straight organic white sugar and think that is fine too. Especially if you are trying to get away from soda. I have never made water kefir before, but I have made kombucha and it sounds like the process is fairly similar. This sounds like something my husband and kids would love. Thank you so much for sharing! Thanks for this great post Stacy! I am definitely going to try this soon! I love carbonated beverages, especially in the summer. But we’ve stopped drinking pop for obvious reasons, and sometimes I just crave something carbonated. I know my kids will like it, and maybe even my hubby too, and I can feel good about them drinking something other than water or milk that is actually good for them! Can’t wait to get started! I bought some dehydrated water kefir grains (along with a plastic strainer) off of Etsy. They are sitting on my counter at the moment. Hoping to start a batch on Sunday. Excited to try some. My hubby is not a big soda drinker, but I’d love to get him ‘hooked’ on something with some probiotics in it! I made water kefir a few years ago, but didn’t realize you could make fruit varieties. I only made citrus (lemon and lime) and though I enjoyed that, it got old after a while. I think my family would enjoy the fruit flavors better. I’ll have to give it another try. I have been interested in making water kefir but am concerned about the final sugar content. We don’t drink pop or juice and generally avoid refined sugar (I know I can’t use honey in water kefir). Does anyone know how much sugar remains per serving or as compared to plain old juice (no sugar added)? While I’m not sure on the sugar content, I would guess it would depend very heavily on original recipe composition, fermentation rate, and brew time. So, it is unlikely anyone could give you an excellent answer on that without having specifics such as those. However, this article: http://winemakermag.com/stories/techniques/article/indices/35-techniques/501-measuring-residual-sugar-techniques may provide you with information that would be useful in evaluating your brew as it goes, to get the final composition you want. Just note that the brew will eventually turn to a vinegar if you let all of the sugar get used up. 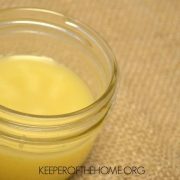 As a note, you can use honey for the kefir, but honeys that have antibacterial effect will eventually kill off the kefir. So, if you really prefer honey, you could ostensibly brew with it while reserving some grains and storing them in standard sugar water. Personally, I’ve been using a mix of white sugar and unsulphured blackstrap molasses. Is water kefir safe for children to drink? Doesn’t this process produce alcohol? Bacteria eating sugar creates alcohol, right? I would love to make this for my teenage son and younger daughters as an alternative to soda, but if there is alcohol in it I am not sure I feel responsible giving this drink to my children. Comments, please, as I am new to water kefir. @Sarah, From all that I’ve read, it is totally safe. Yes, it does produce a very small amount of alcohol, but it is quite minimal, far less than any sort of alcoholic beverage like wine or beer (which are usually a minimum of 5-7% alcohol). To put it in perspective, everything I have read suggests that the alcohol content of water kefir would not be more than about 1%, and usually less. It seems that longer carbonation times and more sugar would potentially increase that, so keep those things in mind. My husband and I read this post (me first, then him) and decided to try it! We have friends that make milk kefir and want to try our water grains… how much is a good amount to get someone started? And how much should we always keep on hand? @Musings of a Housewife, Have you made kombucha yet? The process isn’t much harder. The first couple times, it requires a bit of extra energy because it’s a new thing, but then it quickly becomes a simple task. I had no idea you could buy water kefir. I don’t know of anywhere in Canada to get it! @Musings of a Housewife, I thought it sounded overwhelming at first too but I needed another purchase so I could qualify for Amazon free shipping and Cultures for Health has such excellent reviews so I just jumped right in. Not sure if they can ship to Canada, but it’s worth checking out. I received mine very quickly and they doubled with the first batch. So far I’ve only tried the lemon/ginger kind, but I love it. It’s much easier than it sounds! a friend just gave me some of her kefir grains today and i am making my own for the very first time tonight! eek! i am excited and nervous. not sure if i will like it, but so excited to try it out. thanks for the great step by step process. i heard i can add some of this into a smoothie to hide it from my kids. how does that turn out? any reviews or proportions recommended? any certain smoothie ingredients NOT to mix it with? thanks for the help! Any suggestions on how to keep the kefir from producing so much alcohol? I feel like mine is a little too alcoholic. @Samantha Berg, It might just be that you are fermenting it a bit too long. Each kitchen (or wherever you ferment) is a bit different and yours may be just too warm and is fermenting it more than you prefer. I would try putting it in the fridge sooner, maybe 6 hours sooner? Just experiment. @Stephanie @ Keeper of the Home, Thank you! I will give that a try. Hmmm… Some of my batched will defiantly give me a buzz. Thats fine while I’m at home, not the best to consume at work. Mine taste great when they are on the counter. When I get the flavor I want and I don’t drink it all that night I’ll place any extra in the Fridge. the next morning, wow, its much more like hard cider. Not at all the same as it was the night before. Maybe only rinse with the proper water, like the water you’d use to make the kefir. I accidentally rinsed my grains with tap water. OOPS! But I was trying to stop them from smelling too much like yeast. Someone over at Cultures for Health reccommended rinsing them when that happens. I’ve made milk kefir before and I love it! I made my first batch of water kefir last week and just took the grains out after 3 days. I have a Candida yeast infection so I can’t have sugar. My kefir is still very sweet so I’m afraid to drink very much of it. How much sugar is left after fermentation and how do I know when it’s done? I’ve never had water kefir so I have no idea what it’s supposed to taste like. This is probably more than a bit late for the infection you mentioned, but should you need to know the sugar content in the future, the methods mentioned here: http://winemakermag.com/stories/techniques/article/indices/35-techniques/501-measuring-residual-sugar-techniques might help you out. Is this similiar to kombucha? Better than? Easier to make? Thanks! It has some similarities to Kombucha in that it is a fermented, probiotic beverage. I haven’t made Kombucha yet, so I can’t say if it is easier or not. I noticed Stephanie made a comment below stating that it was not much harder than Kombucha. So, I’m guessing it might be a tad more involved. It really is a simple process once you get the hang of it. My first batches turned out tart, but the last few have all been sweet. I read that means I’ve done something wrong, is this true, and what would that be. Is it still ok to drink Kefir water if its sweet? Stacy, thanks for your clear description of making water kefir. Have recently gotten into making sauerkraut and had never even heard of water kefir until about a week ago. With your help, my first batch is now fermenting. The first of many batches. I would love it if you still have kefir grains you would like to share. I live in Washington, Missouri. Ive been making the milk kefir and having success. I am now trying the water kefir. I’ve made 4 batches but I am not sure how it is supposed to taste. Mine is quite sour tasting. I threw away the first 2 batches. I really need some feedback please. From what I understand, the drink will get progressively more sour as it sits. This is because, as the grains continue to eat the sugar, they produce alcohols, CO2 and organic acids as byproducts, and the flavor sours. So, straining the grains out the first day will provide a less imbued but sweeter drink, day two might provide a stronger flavored but still sweet drink and day 3 might result in a kefir vinegar that is really useful for cooking, cleaning and even hair care, but not particularly yummy on its own. (The progress rate will be dependent on things like mineral and sugar content, temperature, etc.) So, if all the batches are coming out sour for you, it might be worth trying to strain the grains out earlier and/or playing with your mixes. Ooh, Thanks so much. I’ve been tossing my kefir vinegar, after using it in cooking and not being pleased with the results. I could kick myself for not realizing I should use it for my hair. Live and Learn right! Thanks for the tutorial! I’ve been too scared to attempt kefir making!! 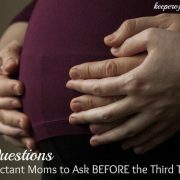 Do you know if it is safe to consume water kefir during pregnancy? Yes, it is. Water kefir is just like drinking probiotics, and isn’t particularly detoxing or anything like that. Enjoy! Thank you so much! I thought that was the case, but couldn’t seem to find any certain information. I measured the alcohol content of mine and it came out to 1.3%-1.5%. I’m not worried about the small amount of alcohol, especially because I’m in my third trimester. dang, so there is alcohol in it. i wondered as i read. can’t make it. hubby almost 10 yrs recovering. There isn’t!! I don’t drink at all and do water Keifer. Just don’t add any fruit to the keifer while it’s fermenting. But there is no alcohol in it! If you do a second fermentation with fruit you could produce alcohol because of the fruit. I just don’t add fruit to my fermentation process! I drink it an it does not effect me. yes you can give it to your husband. Don’t; add the fruit and I add fruit to the second stage… Love it and have and will be in recovery forever. Hi I have been making water kefir for a couple of weeks now and they are not growing does this mean they are no good please let me know. I’m curious, if cultured foods are a regular part of our diet, would that satisfy our need for probiotics? Do you know what kinds of good bacteria are produced in kombucha, kefir, sauerkraut, yogurt, etc. I want to make coconut water kefir…the coconut water I have is pasteurized…and I can’t find water kefir grains locally, just milk kefir grains…can I use those?….do i put the grains directly in the coconut water, or ferment them in sugar water, then add them to the coconut water? also, could I use Bragg’s Apple Cider Vinegar with the mother as a starter for coconut water kefir? add it direct to coconut water? Excellent post and simple to follow – I love kefir water! I went in search of an easier water kefir recipe than the one I used for my first batch – and I found yours! So simple! My first batch was much more complicated, and had molasses in it, which I wasn’t thrilled with. One thing that I brought over for my first recipe was to used cooked, ground up egg shells in place of the mineral drops. I used unpasturized honey instead of sugar. Keeping my fingers crossed! Meggin D, everywhere I have read about making water kefir says to absolutely not use honey in any form as it will kill your grains. Any other kind of sweetener seemed to be okay though. I have recently started making nut cheeses from the book: Artisan Vegan Cheeses. 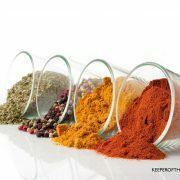 The recipes start with a product called: rejuvalac. Rejuvalac is also a fermented water. It is made by sprouting a grain (I use quinoa) and then soaking the quinoa for a few days. No sugar is added. Obviously rejuvalac and kefir water are different. They are made differently. But I’m trying to figure out *how* they are different. Both would be water filled with bacteria, right? Would both be beneficial probiotics? Does using the water kefir grains guarantee (or encourage) a specific set of bacteria–ones that would be different from my rejuvalac? One of the reasons I am asking is because it is easy for me to get quinoa and I like making rejuvalac. But I also often wonder just what is really in there. I have no way of knowing. Would starting with the water kefir grains allow me to better control which bacteria I am eating? Ooops. I forgot that I also wanted to thank you for this post. It was extremely helpful! Know it is an old post, but I just found it. 🙂 Thanks! Thank you for sharing this detailed information! I can’t wait to try this. 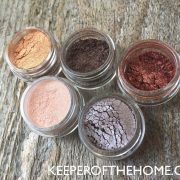 I am wondering if I can use coconut sugar in the process since it is a sugar that is high in minerals. Do you know if it will work as good as other sugars?